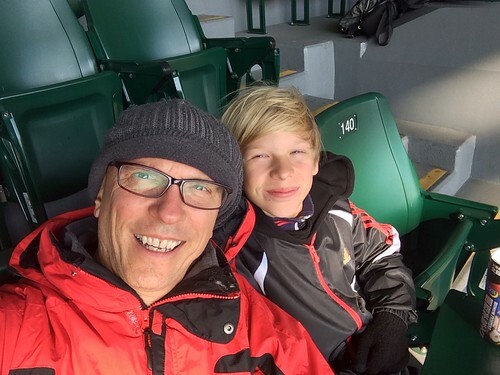 Owen and I attended the 69th Koshien Bowl yesterday. 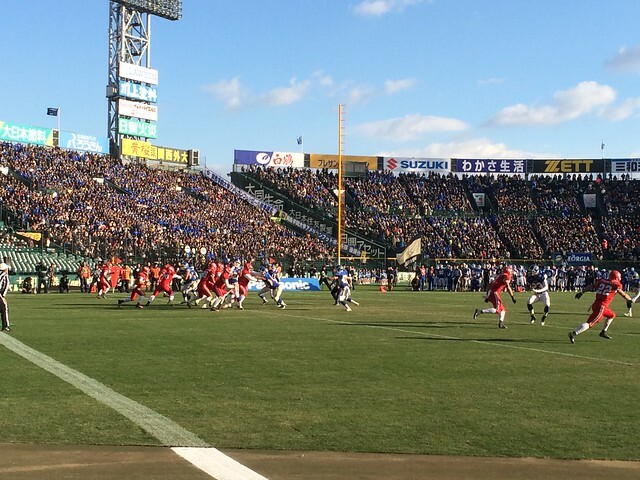 This is Japan’s equivalent to the NCAA Football Championship Game. This is North American football, not soccer for my international readers. The bowl began in 1945, probably due to the American occupation after World War II. I happen to be working for the “Alabama Crimson Tide” of Japan’s college football scene, the Kwansei Gakuin University “Fighters”. They are known as “KG” to us. 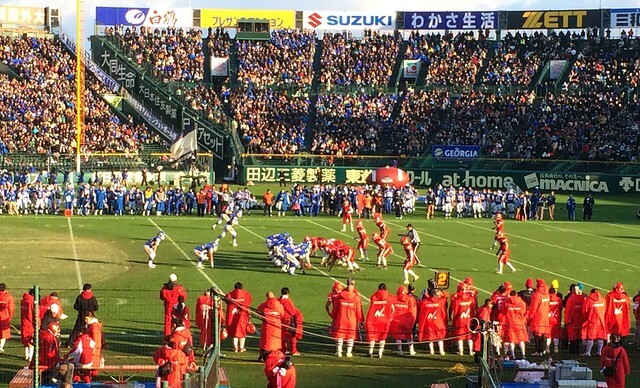 They defeated Nihon University 55-10 to win their fourth consecutive championship and their 27th in the history of the game, the most of any university. The game is named after Koshien stadium, the famed baseball stadium of the Hanshin Tigers professional baseball team. The game pits the east champ (Tokyo/Nagoya) versus the west champ (Osaka/Hiroshima). KG represented the west region. It was a great atmosphere on a sunny, chilly, December afternoon in the stadium, located near Kobe, about an hour’s train ride from our home in Minoh. There were marching bands, cheerleaders, probably about 30-40,000 fans and most importantly, some excellent football. Both teams were well coached, especially the KG Fighters (blue uniforms). The Phoenix of Nihon University (red uniforms) didn’t stand a chance however against the mighty fighters. KG controlled the line of scrimmage and had many long drives. I was surprised at the technical skill of the players, it looked like a very well played high school game in the USA, much like the Arctic Blast, a semi-professional team from my part of Michigan. They were not as athletic as American teams, but totally organized and fundamentally sound. There were screens, traps, misdirection, read option, KG even tried a flea flicker play. The field goal kickers were excellent as well, one being from 40 yards. The Fighters now go on to play in the Rice Bowl next month. The winner of the collegiate championship plays the winner of the corporate league in a game called the Rice Bowl. No doubt this was made up by Americans. The corporate league are teams sponsored by companies, some with only employees of that company or teams that hold tryouts. They usually have an older and better quality of player. The college guys have not won since 2004, but KG should have a pretty good shot this year. The past three years they have lost to the Obic Seagulls, once only by 5 points. As you can see in the video below, the action was quite good in the game. I enjoyed the day more just because it was father and son time. Nadia took the two little ones to Universal Studios Japan, while Owen and I had a great day at the stadium. We played basketball in the morning at the gym, rode our bikes to the train stationand ended the day with a stop at Owen’s favorite restaurant, Subway. It is a day that I would happily relive over. The best part of the day was spending it with my son! Hello Bill, my name is Dennis Lin. I’m a american football blogger Taiwan. I know little about Koshien Bowl until I read your blog. I also wanna gather some info and write an article about this bowl game. May I quote from your article and use the first photo of this article in my writing? I will give photo credit to you and show your web address in my article as you agree. Yes you can use my blog for your article and any future articles. I work for Kwansei Gakuin university so if you need any information from them let me know. They played Princeton University in March and were overmatched by the size and speed of the Tigers.